I have desided to make a few goals for 2008. 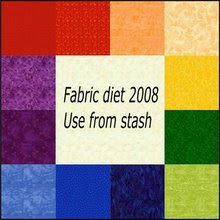 One of my goals will be serious stash redusing work. I have added Hannes badge to my sidebar. I have also signed up for May- Britts challange: Who finish the most WISP's in january? Like some other girls I know (no name given hi hi) I have too many unfinished projects in my sewingroom. Tomorrow I will start taking photos of my WISP's (Work In Slow Progress). Untill now I have avoided to talk about or show you my UFO's or WISP's. Soon you will know why! Just have to show you new tablecloth made espesialy for Christmas. It is quilted by Quilt'n. The house is clean, three decorated and refrigerator filled with food and drinks. I'm ready! I have compleeted my 12 tasks on my list, in time to keep my promise to my self and my family. All was done by friday. I just had to do kitchen floor on saturday. Sunday we had visiors for coffee and exchanged Christmas presents. DH is cooking tonight. I have allready made dessert. I can just relax and enjoy the Christmas spirit. We have now snow. It's raining today. Earlier this week we had frost. The landscape looked beautifull with ice crystals on all threes. Unfortunatly I forgot to take photos. Today I had coffee for some friends at my house. Last week I made triangulare coffee placemats. I found them very handy. Can be used for placemat for flowers and in the bread basket. As you can see, Christmas spirit is entering my house, little by little. Every night I have been working in front of TV. I have stuffed a lot of Christmas hearts I'm giving away as presents. As you can see I have made a lot and some is going to be hanged in living room window tomorrow. Need to put ribbon on first. DH have written a nice Christmas letter for family and friends. This evenings task is to put all of them in envelopes and put stamps on. Not bad. One more thing wiped out of my list. Today is 2nd sunday in Advent. I have made reasonable progress on my "What to do" list. When I was a little girl my mom always made Advent calenders for me and my brothers. About 10 years ago she refreshed the tradition and we started to make Advent calenders for each other. My mom is also a quilter :-) The first year the 24 small gifts containd blocks with hearts to applique and complete Advent calender on the photo. This year she have realy made me curious. So far each gift have containd 9 squares to make a ninepatch block with the top fabric for center. There is no more explaining than to make ninepatch blocks!! And the fabrics are diffrent colors and prints. Is she doing some stach redusing tricks? Making me do blocks for a quilt top? The blocks are big. Each square in the block is 5 inch. One small packet each day is fun! !